Home Good question! Is ‘Holland’ and ‘The Netherlands’ the same? In short: yes. ‘Holland’ and ‘The Netherlands’ are names for the same country. It’s the small country that lies next to Germany in Europe. Officially, the name of the country is ‘Kingdom of The Netherlands’. The language is Dutch. The Netherlands is often called ‘Holland’. But ‘Holland’ is the name for only 2 provinces of The Netherlands: North-Holland, province of the capital city Amsterdam and South-Holland, province of The Hague (seat of the Dutch government), Rotterdam (big port) and Leiden (famous university). Utrecht is another important city, it lies close to Holland in the province with the same name: Utrecht. So only the West of The Netherlands is ‘Holland’? Yes, only the West of The Netherlands is ‘Holland’. People who are from one the other 10 provinces would never say they are from ‘Holland’, because they are from a different part of the country. Also, Holland for them feels like a different country, because Holland (North-Holland and South-Holland) is so full of big cities. Holland is also the part of the country that is below sea level. In fact, Dutch people who are not from the West of The Netherlands (in Dutch also known as the ‘Randstad’) use the word ‘Hollander’ as an insult. ‘Hollanders’ are people from the West who feel superior to the ‘provincial people’. And that arrogance is not much appreciated in the rest of the country. Why do Dutch people say they are from Holland and not The Netherlands? Dutch people, when they are travelling to other countries, answer ‘Holland’ when asked where they are from. The reason is that it is easier. Holland is a better known name than The Netherlands. Why is Holland better known than The Netherlands? Holland is much better known in the world because of its history. During the Dutch ‘Golden Age’, the 17th century, Holland was the most important and most powerful place in the world. Ships from Holland sailed the entire world. Sailors, the Dutch navy and merchants discovered new lands, set up new trading routes and trade cities, basically ruling the world. The word Holland was known, and feared! After the Dutch liberated themselves from the Spanish Rule in 1581, Holland and 6 other regions joined together to form the first country. They named it the ‘Republic of the Seven United Provinces’. That was followed by ‘Batavian Republic’ (1795 – 1806), the ‘Kingdom of Holland’ (1806 -1810, Louis Napoleon as self-proclaimed King), ‘United Kingdom of the Netherlands’ 1815–1839 (with Belgium) and the present day ‘Kingdom of the Netherlands’, or The Netherlands (in Dutch: Koninkrijk der Nederlanden). Why do Dutch people shout ‘Holland’ when they play football and not Netherlands? Officially, when the Dutch team plays, we play under the name of The Netherlands. But when the Dutch sing their songs, paint themselves orange and dress themselves up, they use the word ‘Holland’. A popular Dutch song in football is ‘Hup Holland Hup’, which means something like: Go, Holland, Go. All over the world, the orange team is known as Holland. 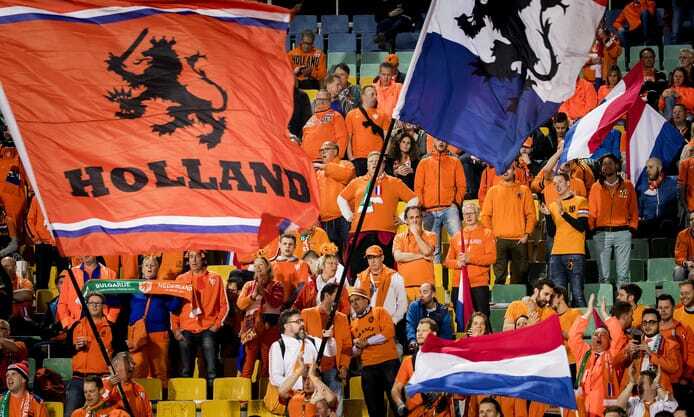 Maybe we hope by chanting the word ‘Holland’ we can still be as victorious as we were in the 17th century!